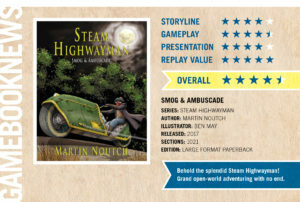 Steam Highwayman is 90% funded and new backers are still arriving every hour or so. It’s been very exciting to watch and new opportunities are becoming available to share the project further afield. For example, gamebooknews.com has run an article on their website, and shortly before the launch the Steampunk Journal also featured the project! I’ve had several friends sharing the project online – so far Facebook has been the largest single source of backers – but a few influential backers have attracted their followers too. Please keep sending your friends to the Facebook Page – I want those likes to unlock my development documents – and please let anyone you think would enjoy the adventure know. Don’t forget to mention the free demo to download: DemoSH1.1!